OER Can Be: Full courses, learning objects, tests or any other tools, materials, or techniques for use in teaching, learning, and research. Definition of OER is from UNESCO - opens in a new window, and The William and Flora Hewlett Foundation - opens in a new window. These rights, or permissions, are made possible through open licensing. For example, Creative Commons open licences help creators of OER retain copyright while allowing others to reproduce, distribute, and make some uses of their work. Below are four key categories of resources that are often considered to fall outside the definition of what is truly OER. Of course, the best mix of materials to meet any given set of learning outcomes will vary, and may include a combination of OER and the materials listed below. The key is knowing which resources will best meet your objectives for instruction, and for learners. Through open licensing, the mission of the OER movement is to encourage the full range of the “5 Rs” permissions of use (see prior tab). Some argue that unless an open licence allows for adaptations, then the resource is not truly OER. The image below positions Creative Commons Licenses - Opens in a new window on a spectrum from more to less open. As depicted, resources that are licensed ND (No Derivatives), are in some cases considered not to be OER. 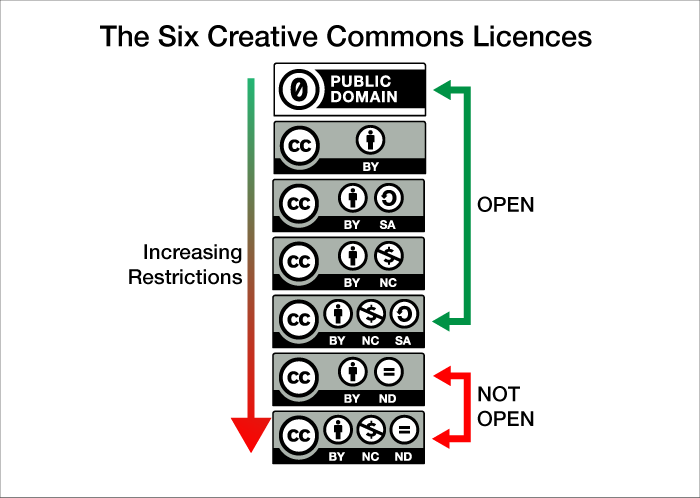 The Six Creative Commons Licences image is a derivative of an image in Keynote Slides (November 2014) - Opens in a new window, by Cable Green, licensed under CC BY 4.0 - opens in a new window. All the available resources on the web that you may have access to, but that are not in the public domain, or do not carry a Creative Commons licence or other open licence, are not OER. A library’s subscription-based resources (journals, videos, and other materials), while accessible to students and faculty, are also not OER. This is because their use in education may be limited by licence agreements. Open access is an important concept, which is related to – but distinct from – that of OER. Open access typically refers to research publications of some kind released under an open licence that allows for their free access and use (definition from Basic Guide to Open Educational Resources, 2015 - opens in a new window). Open access publications do not usually allow for adaptation and remixing. While open access articles are freely accessible, authors may retain their copyright and/or assign rights to publishers or users, so permission may be needed for copying and adaptation. 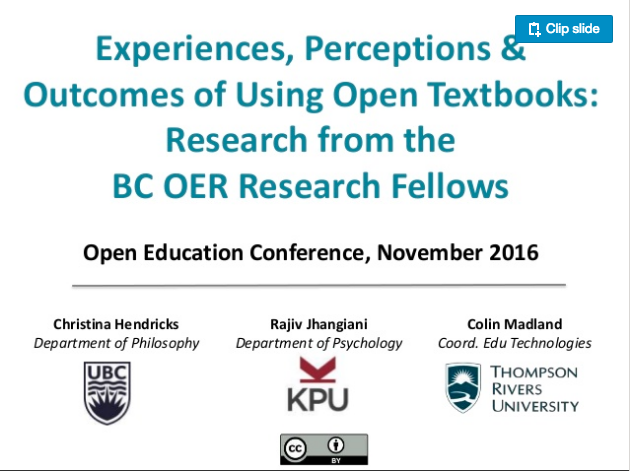 A Review of the Effectiveness & Perceptions of OER video transcript. Searchable database of research and other information on all aspects of OER. Interactive map of the global OER movement, with information on people, organizations, services, projects and events related to OER. Online hub for OER and tools to support integration of OER into teaching and learning. For faculty, OER often begins with a need to fill content gaps, or to identify enhanced or replacement resources for a course. The following list of steps illustrates a typical OER development process to consider as a starting point. Start by looking for suitable resources that will contribute to your instructional objectives. Search dedicated OER repositories, including the eCampus Open Textbook Library - Opens in a new window. Consider your own materials that may be available offline, including lecture notes, handouts and other resources prepared previously. Be sure to check your college's intellectual property policies - Opens in a new window to see if a material you’ve developed can be used and shared as OER, with an open licence. See the Curating Module in this toolkit for additional support in finding OER, or contact your campus library for help. With your collection of resources at your disposal, start piecing them together to create a learning resource or set of resources to meet your instructional objectives and learning outcomes. This is a creative design process of building an educational resource from scratch and/or using components you have found. As you compose, use OER authoring tools to support your work, such as the Open Author Module Builder - Opens in a new window. See the Creating Module in this toolkit for additional support in composing OER, or contact your college's Instructional Designers or Learning Technology Specialists for help. You may decide to use the OER that you compile “as is,” by printing or downloading them, or sharing the links with your students. You may also decide to adapt the resources to local needs, or even revise them later based on feedback once implemented. Your adaptations may involve minor corrections and improvements, remixing or adding new components, or even completely reworking the resources. See the Creating Module and the Curating Module in this toolkit for additional support in adopting or adapting OER, or contact your campus library for help. Through open licencing, OER opens up possibilities for new, more collaborative teaching and learning practices--because the materials can be used, adapted and shared within and across learning communities. As you implement OER in your courses, take advantage of these possibilities. Pair up with a colleague on the implementation of OER, invite peer and student critique of the materials, or engage students as co-creators in OER-based assignments. For additional information on OER practices such as these, see the Teaching Module in this toolkit. Make your resources available for your peers and the open education community to find, and to begin the life cycle again. Add descriptors so that others can find and use the resource, and select the appropriate licence for any new/adapted resources. For additional information on sharing OER, see the Curating Module in this toolkit. Below is a quick start kit of initial activities and competencies that libraries may consider as they begin their OER journey--with the recognition that many libraries will not have the resources to support OER in each capacity. See the Advocacy Module in this toolkit for additional information. See the Training Module and the Collaborating Module in this toolkit for additional information. Explore ways to integrate existing OER into library search tools and guides. Start by reading literature on the topic, such as The Role of Open in Strategic Library Planning - opens in a new window, an open access article from Education Policy Analysis Archives. Explore pathways for setting up or connecting to platforms for OER. This may include working with IT to enable integration of OER collections or tools into campus platforms including learning management systems, or to enable a centralized OER access point for the institution. Consider who the key OER stakeholders are on campus--from faculty and administrators--to student associations, campus bookstores, and accessibility services. See the Advocacy Module in this toolkit for additional information on growing OER partnerships. 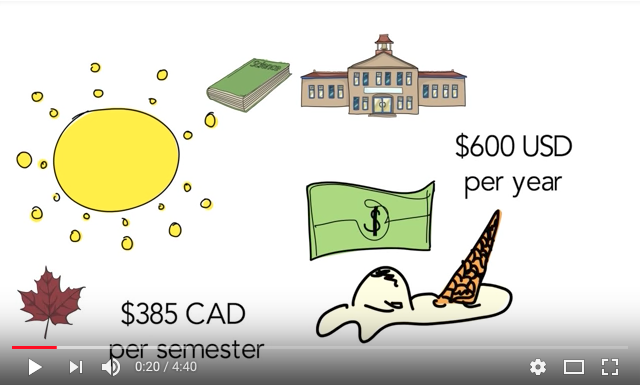 Watch this short video on how OER is creating a new system of education through equal access to knowledge by learners everywhere. You can also download the The OERs video transcript.